The very flat scoop-rocker line of the board and the tips design allow incredible ease of kiting and an amazing grip while going upwind in the lightest breezes. “Am I moving already? !” Thanks to the new channels added on the deck, the board has become a lot more rigid which will allow an incredibly fast and early ride, especially in light wind conditions. 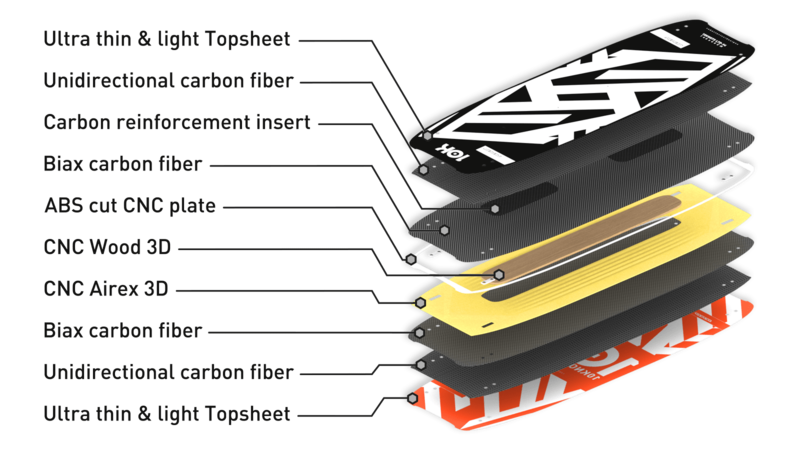 The special construction of the 10 KNOTS V4 LTD, completely built in Airex and Pre-Preg Biaxial carbon, make this board one of the lightest in the market. Not only perfect for twintip racing, light wind and freeriding, the 10 Knots LTD V4 is a planet of its own. TECHNOLOGY: Completely built and assembled in Europe with a new exclusive light technology. CORE: Airex Core + reduced weight ABS sidewalls. LAMINATION: Laminated with pre-preg Biaxial CARBON 220 grms. deck and bottom.